c.803 Part of the Kingdom of the Franks. as a feudal domain by the Frankish king. Roger Bernat II comte de Foix. by the heirs of the count. 15 Oct 1303 Under Aragonese protection (by letters patent). 1396 - 1396 Occupied by Aragón. 1419 First parliament (Consell de la Terra) established. 1512 - 1513 Occupied by Aragón. head of state of France. 22 Aug 1793 - 27 Mar 1806 French Republic renounces position of Co-prince. the Val d'Aran is returned to Spain in Mar 1815. 30 May 1814 Former Andorran status confirmed by Treaty of Paris. 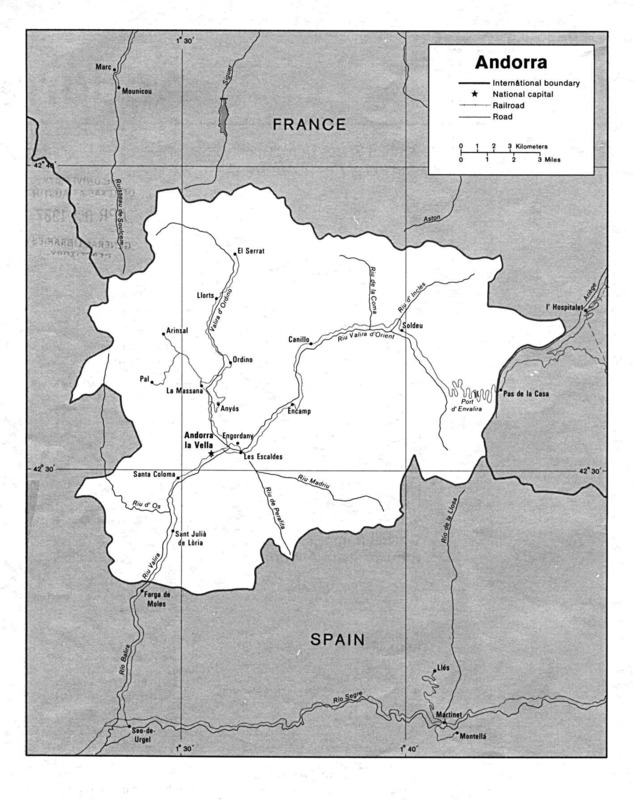 18 Aug 1933 - 9 Oct 1933 Unrest leads to intervention by French gendarmes. acting for the Bishop of Urgell. assumes the style of Co-prince. 15 Nov 1944 - 1945 Intervention by French gendarmes. 4 May 1993 Principality of Andorra (Principat d'Andorra). 1736? - 1737? Antoni Peguera? (c) from 4 May 1993 (in French): Copríncep d'Andorra ("Co-prince of Andorra"), normally as part of the formula President de la República Francesa, Copríncep d'Andorra ("President of the French Republic, Co-prince of Andorra").